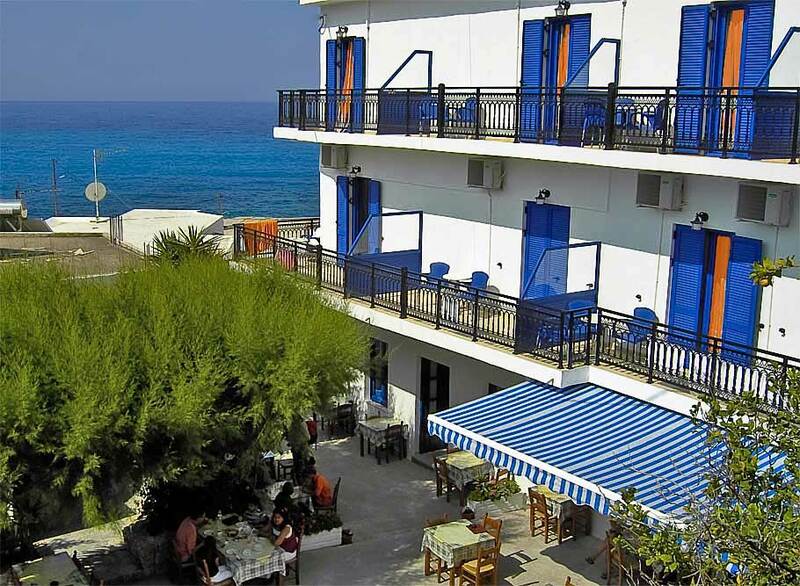 Hotel Stavris Chora Sfakion, Sfakia, Crete - Rates rooms, studios and apartments. Hotel Stavris is a family run hotel with rooms, studios and apartments, direct sea view and very close to the beach. Hotel Stavris is famous for its hospitality since 1969. Our hotel offers High Comfort rooms, mainly situated in the main building, with good sea view, and Standard Comfort rooms, mainly situated in the side building. All rooms have air conditioning and a refrigerator, included in the prices below. All rooms, studios and apartments have a private balcony with chairs and table, toilet and shower, are cleaned every day, and are provided with fresh blankets, sheets and 2 towels per person. You need to bring your own beach towels. Electric water kettles are available on request. TV and PC with free DSL internet is available in the hotel lobby. Free wireless WIFI internet access is available to all our guests. All rooms have air conditioning. Our guests can park their car for free on our parking. High comfort: the best rooms of the hotel with private bathroom and balcony, situated in the renovated main building, newly furnished, with often a good (sea) view. Each room has its own free DSL internet access through ethernet connection (ethernet cable can be borrowed at the hotel reception), free Wifi, refrigerator, a hair dryer, a safe for your valuable belongings, and its own TV and remote. Standard comfort: rooms of the hotel with private bathroom, refrigerator and balcony, situated in the recently upgraded smaller side building, some with good (sea) view. On your request we can arrange a taxi transfer on your arrival on Crete, directly to the hotel. We can also deliver a hire car at the airport or harbour of your arrival, or at the hotel you are coming from.